Scholar Interviews | Septuaginta &c.
Today I have the distinct pleasure of presenting my interview with Dr. John A. L. Lee, who is honorary Senior Research Fellow in the Ancient History Department at Macquarie University in Sydney, Australia. You will read more about his educational and teaching background below, but Lee is widely recognized as a leading scholar of Greek language and lexicography. N.B. There is now a library of fourteen scholar interviews, with more on the way in due course. Let the festal gongs ring loudly in the streets! 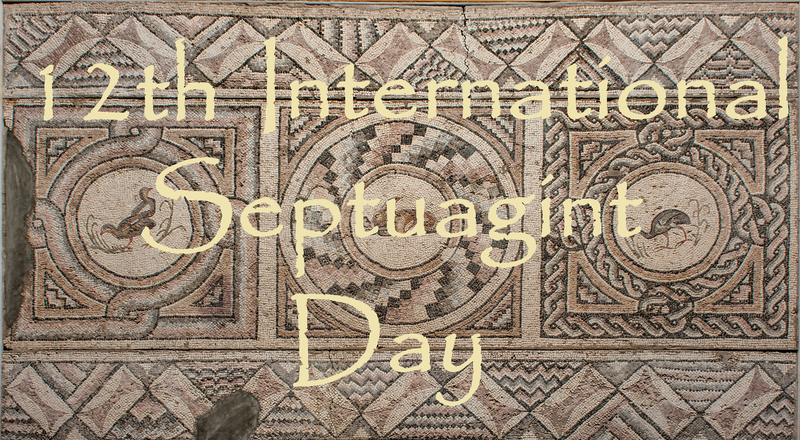 The wait is over: Today is International Septuagint Day. That’s right, it comes only once a year, and that occasion is today. The time has come for another installment of my ongoing interview series with Septuagint scholars. With today’s interview, we are now up to twelve in total, with plenty more to come. This interview highlights one of the senior figures in the field, Dr. Robert Kraft, who is Berg Professor of Religious Studies Emeritus at the University of Pennsylvania (see also Academia.edu). Aside from his work in Septuagint scholarship, Dr. Kraft is well known for his focus on the Apostolic Fathers. He also played a crucial role in creating the earliest digital tools for the study of biblical texts, and was a key player in developing Computer Assisted Tools for Septuagint Studies (CATSS), which is now available in BibleWorks and other software programs. I had probably heard of “the LXX” in undergraduate Bible classes at Wheaton College, where I majored in philosophy (1955), and possibly even before that, from a bright and academically curious but largely untrained young pastor at my home church in central Connecticut. But serious academic and textual contact first came when I wrote my MA thesis at Wheaon Graduate School (1957), on Jesus’ use of Jewish scriptures. Searching for tell-tale terms (e.g. “Septuagint” and “LXX”) in that online file is revealing. I obviously didn’t know much about that complicated subject at the time, but I was beginning to learn. Then, in my PhD work at Harvard, especially with Stendahl and Cross, then with Koester, I began to look closely at pre-Constantinian Greek texts of Jewish scriptures as a possible dissertation topic, but finally settled on exploring Jewish sources in the Epistle of Barnabas (1961). In that context, engagement with things “Septuagintal” grew apace, until it became obvious that the subject area was in need of much more detailed attention. That was my “training” — I never had a formal course in the subject. (For further details see here). Alas, my inquiries were fruitless, but my interest remained and grew. Academic contacts at Manchester did eventuate in several book reviews in the 1960s relating to things “Septuagintal” — details are available in my online bibliography (see reviews of Beyer, Sibinga, Jellicoe, Barthelemy, Vulgate editions, etc.). Thus when the “International Organization for Septuagint and Cognate Studies” (IOSCS) was being formed by Jellicoe and others in 1969, I was invited (or perhaps invited myself?) to be involved. See my two reports on these developments, which contain a great deal of autobiographical material regarding that period: “Jewish Greek Scriptures and Related Topics: Reports on Recent Discussions,” New Testament Studies 16 (1969/70) 384-396, and 17 (1970/71) 488-490. It was at an IOSCS organizational meeting (SBL in Toronto, in 1969])that I made the mistake of suggesting that the newly developing computer technology might be useful for creating the desired lexicon of Septuagintal Greek, whereupon chairman John Wevers invited me to investigate how to do this. That set the stage for much of my further academic life. Be careful what you suggest in organizational meetings! In a small program such as ours at the University of Pennsylvania, there was little opportunity to teach courses specifically on Greek Jewish scriptures, but it was possible at that time (the late 1960s) to involve students in the funded projects that eventuated from investigating how to employ computers in developing better tools for the study of things “Septuagintal.” We were able to obtain funding from the National Endowment for the Humanities and elsewhere to hire graduate students and train them. Thirty years later, by the turn of the 21st century, the policy that graduate students should be on full fellowships (or other guaranteed funding) meant that remunerating students to work in funded projects was virtually impossible. Progress in one area created problems in another. The work stagnated as a result. But how did such ambitious projects get started in the first place? Such a question can best be addressed by reading a few retrospective pieces I’ve produced over the years. Perhaps the best starting point is “How I Met the Computer, and How it Changed my Life,” SBL Forum , n.p. (cited April 2004) [online here] . My study of LXX/OG materials goes hand in hand with my involvement with computerized research. In the 1970s, a team of graduate students and faculty was assembled at Penn to seek funding and begin work on the “Computer Assisted Tools for Septuagint Studies” (CATSS) Project under the broader umbrella of the newly founded “Center for Computer Analysis of Texts” (CCAT). Much of that story is told in the introductory issue of my OFFLINE column in 1984 (online here) including a fictional interview to address various questions about the situation, and in my aforementioned article on how the computer changed my life. At the time, graduate students were allowed to do remunerative work in academic projects, and a couple of them had some previous exposure to computing (notably the late Jack Abercrombie, with programming skills, and Bill Adler, who ran David Packards Morph program on the mainframe computer); they became mainstays in the development of CATSS (see “Computer Assisted Tools for Septuagint Studies” [with Emanuel Tov], Bulletin of the International Organization for Septuagint and Cognate Studies 14 (1981) 22-40 [online here]). In the long run, the CATSS project aims at creating a comprehensive and flexible computer “databank” available for efficient scholarly research on virtually all aspects of Septuagintal studies–textcritical, lexical, grammatical, conceptual, translational, bibliographical. In many ways, the successes and failures of our CATSS project have changed the field, directly (through computer materials produced or made available) and indirectly (influencing others to do similar things or attempt newer approaches). We have enabled free online access to the computerized Greek anthology (LXX/OG) and for many of those books, to the textual variants; also to the parallel Hebrew/Greek materials edited by Emanuel Tov and his crew (using Abercrombie’s programs), and to the morphological analysis (overseen at first by Bill Adler). All of our goals have not (yet) been realized — the work on variants is far from complete (mea culpa!) — but anyone starting today to do careful work on the Old Greek materials has access to a much richer and more easily accessible “playing field” than when my generation and its predecessors began such investigations. I would like to think that by providing better control of these basic textually-oriented matters, and by paying close attention to the methodological issues involved, students of this subject area are in a better position to investigate historical and cultural backgrounds of the materials, as well as the materials themselves, among other things. Traditional terminology and “conservative” ideas hinder further research in some areas. “The Septuagint” is a construct based on the development of codex technology in the 3rd and 4th centuries CE, so close attention to the varieties of translations generated in the world of scrolls and later included in that “LXX” anthology is still needed. And what I’ve called “the tyrrany of canonical assumptions” — i.e. begging the question about the value and status of certain materials (2006 SBL Presidential address online here) needs also to be avoided in establishing the methodological starting point of such studies. The same sorts of histories and backgrounds cannot be assumed for the wide range of translational Greek materials that came to be included in “Septuagintal (and Cognate) Studies,” nor should other translations that failed to be included in “the canon” be excluded. Even in the “original Septuagint,” the Greek Pentateuch, diversity of origins (i.e. different translators) seems detectable in the preserved textual materials. Much more needs to be done with these sorts of approaches, and behind the translators (and for that matter, later ancient editors) are real people in real historical settings that may be discoverable and significant. Similarly complex but much needed is attention to the “uses” of Jewish scripturesque materials in various authors and settings. For example, the similarities are striking but little explored between what we know or suspect about the earliest stages of LXX/OG origins and transmission, and the creation and diffusion of “Old Latin” scriptural texts, or other early versions of Jewish scriptures, for that matter. How and why were translations generated, collected, and circulated in those blurry “earliest” periods, then how and why were they used as time went on? I’m an optimist. I still hope to see closure on the project of encoding all published variants to these Greek texts. Some of the work can be automated, but a great deal requires close work by someone who understands the issues, including the benefits of the system developed by CATSS (see the Kraft-Tov article in BIOSCS). Call me? I’m also still interested in pursuing the questions relating to the technological moves from scrolls of individual books or even parts of books to small codices, and finally to the mega codices of the 4th-5th centuries. This partly involves keeping up with papyrological (and related) discoveries and studies. I’m still waiting for some clever programmer to produce a paleographical analysis tool that will help reduce the subjectivity of that type of judgment. Call me? It is what “you” (the next generations) will make of it. I’ll be gone, but hopefully what remains from the work I’ve been involved in will help move things along to firmer and more interesting results for the study of ancient Jewish and Christian (and also other) attitudes and activities. There is a lot of food for thought here, and I think that Dr. Kraft’s expertise and perspective on this discipline offers much for younger scholars and interested students.